As promised here is the boy version. It was funny when creating it I found a silhouette of a boy, added the quote, but in place of the butterfly on the girl version what should I put ? Girls are easy, butterflies, flowers, fairies, you name it, but boys ? I was thinking of a ball or a frog or something, but went with the bike. I just LOVE the things you come up with! That's why I´m tagging you, go to my blog: http://cindyrelly.blogspot.com/ and read the first part and then please feel free to jump in. 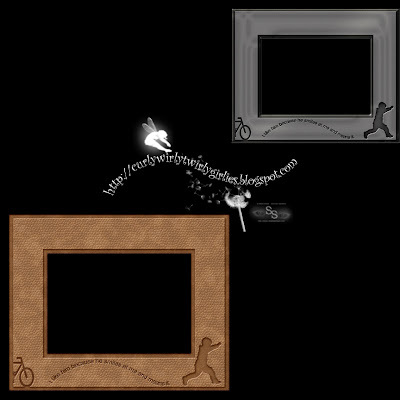 Thank you for sharing another set of cute frames (the boy and the girl set). these are just darling! i don't know where you come up with all these wonderful things! i'm just glad you have all this great creativity spilling out! thanks!! !